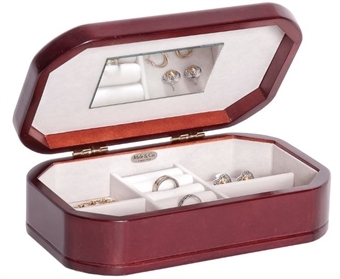 Not to be overlooked, this Morgan style jewelry box is compact with sleek styling, luxurious ivory lining, & mirror. Wonderful addition to the smaller dresser, has four compartments plus center ring rolls. Excellent storage for earrings, rings, & bracelets. This jewelry box is manufactured by the Mele Jewelry Box Company. ChasingTreasure.com is an authorized dealer of all Mele jewelry boxes. History: Mele Jewelry Box Company was founded in 1912 by Emidio Mele, a designer and builder of window displays who began creating gift boxes for jewelry items. The business grew and survived the Great Depression by building the boxes that held the Purple Hearts awarded during the war. During the 1940' s the company prospered after introducing a jewelry box with an automatic tray that rose when you lifted the lid. In 1948 Life Magazine noted it as one of the top 10 best selling holiday gifts. A children's box with a spinning ballerina was an instant success. 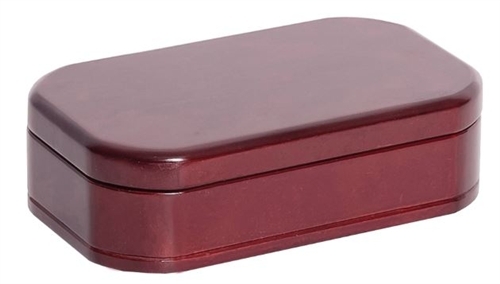 Remember your very first jewelry box? It probably had a ballerina that twirled to a musical tune. By the 1950's, Mele had experienced spectacular growth and had become a household name. Mele promises affordable quality and attention to detail. Today: Mele introduces over 75 favorite jewelry box styles each year with two seasonal collections for women, men and children. Designed for both travel and home, Mele's jewelry boxes are available in a wide variety of sizes and designs to suit every jewelry storage need. Expect quality craftsmanship & classic style when you purchase a Mele jewel case. Quality Assurance 1 Year Warranty: This Mele jewelry box has a one year warranty which covers manufacturer defect and inferior workmanship. If within one year of normal use it is found to be defective, please contact customer service with specific details about the problem and we will assist you with an exchange replacement from the manufacturer. Instructions vary by brand, please contact customer service for assistance with a warranty claim.